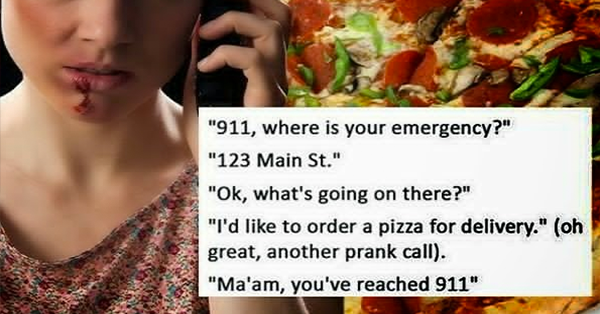 Emergency Hotline 911 Receives a 'Pizza Order' From a Lady Who Needs Help! A woman who is a victim of domestic violence called 911 for help but was unable to directly discuss about what was happening to her so she used a code-like conversation by starting to order a pizza. Fortunately, the dispatcher did not take her call lightly, instead he became intuitive and analyzed her situation very carefully. Read the transcript of the conversation between the victim and the dispatcher and noticed how well their thoughts were connected to each other. "911, where is your emergency?" "Ok, what's going on there?" "I'd like to order a pizza for delivery." (oh great, another prank call). "Yeah, I know. Can I have a large with half pepperoni, half mushroom and peppers?" "Ummm…. I'm sorry, you know you've called 911 right?" "Yeah, do you know how long it will be?" "Ok, Ma'am, is everything ok over there? Do you have an emergency?" "Yes, that's correct. Do you know how long it will be?" "I have an officer about a mile from your location. Are there any weapons in your house?" "Can you stay on the phone with me?" "Nope. See you soon, thanks"
According to the dispatcher, he checked the history of the address given by the lady and found out that there were records of multiple domestic violence from the previous calls. Finally, the officer arrived at the house and immediately saw the lady in bad shape with her drunk boyfriend. Her partner was arrested for beating her. The dispatcher said that she was intelligent to pull that kind of trick and that emergency call is the most memorable one for him.